Vintage style Beauford wedding car. This 1930's style, four door convertible Beauford is finished in Ivory with a lovely Beige coloured interior. 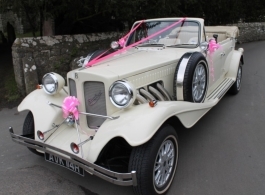 The vehicle is fully convertible allowing an open top experience for your special day, the hood can remain in place if required to give full weather protection.